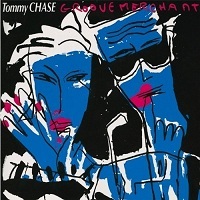 Tommy Chase was born in Manchester in1947. He was largely self taught and turned professional in the mid 1960s and after working in night clubs and on cruise liners settled in London in 1973. Through the 1980s and '90s he led his own straight ahead hard driving bebop groups with some success in the clubs and at the first Soho Jazz Festival. He used young musicians, notably sax player Alan Barnes, guitarist Dave Cliff and bassiat Andy Cleyndert. Others who worked with him included Art Themen and Harry Becket. He was chosen to accompany visiting Americans including Al Haig, Jon Eardley and Joe Albany. 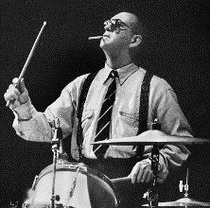 He was a forceful drummer very much in the hard hitting style of Art Blakey and many commented on his skill and timing. He quit the music scene early in 1999 after a final gig at the Jazz Cafe in Camden. Jon Eardley (tp) Ray Warleigh (as), John Burch (p), Danny Padmore (b), Tommy Chase (d). Chasin' The Bimpt/Like Someone In Love/What's New?. Ray Warleigh (as), John Burch (p), Danny Padmore (b), Tommy Chase (d). I Remember You/Stars Fell On Alabama/Speak Low. Alan Barnes (as,ts), Nick Weldon (p), Andy Cleyndert (b), Tommy Chase (d). Minority/Blue Sunset/The Message/Del Sasser/No Problem/Ladybird. 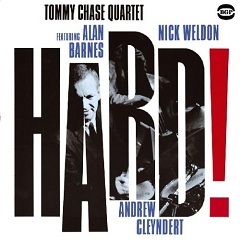 Alan Barnes (sop,as,ts), Mark Fitzgibbon (p), Alec Dankworth (b), Tommy Chase (d). Drive/Close Your Eyes/Love For Sale/Sunset Eyes/Bogata George/Honest Jon/Whisper Not/Straight Edge/Tin Tin Deo/Ray's Idea. Kevin Flanagan (as,ts), Mark Edwards (p), Martin Klute (b), Tommy Chase (d). The Message/Double Secret/Killer Joe/A Night In Tunisia/Groove Merchant/So Tired/Alfie's Theme/Get rich Quick/Sunset Eyes. Ben Waghorn (as), Garry Baldwin (org), Arnie Somogyi (b), Tommy Chase (d). Sneakin In/Calypso Blue/I Have A Dream/Rebel Fire/Trouble In The Casbah/Cry Freedom/The Predator/My Groove, Your Move. Ben Waghorn (as), Garry Baldwin (org), Dominic Howles (b), Tommy Chase (d). Googa Mooga/Trouble In The Casbah/Harlem Nocturne/Killer Joe/My Groove, Your Move/Cry Freedom/I Have A Dream. This page was last updated during February, 2017.